ErneyGraft consists of a balloon which fills out the aneurysmal cavity with a central channel. This ensures hinderance of further blood loss through the rupture site and secures blood flow to the legs. The device works as a pressure regulator, since the central channel has a smaller diameter than the normal aorta. This will immediately after placement increase the blood pressure to organs crucial for survival such as the brain, the heart and the kidneys still having enough perssure to support legs at rest. The device can be placed as well as removed percutaneously. Proof-of-principle of the novel graft has been shown in a porcine model. 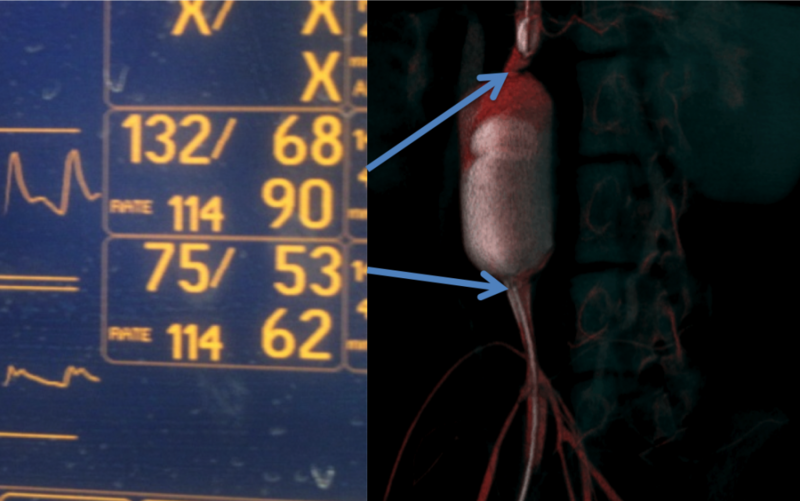 The illustration below shows intra-arterial pressure measured above ErneyGraft (MAP 90 mmHg) and below (MAP 62 mmHg). It proves the pressure regulating ability of the graft, giving priority to organs that are necessary for life such as: kidneys, heart and the brain. The video below with ErneyGraft demonstrates no contrast leakage outside the balloon, still flow down to the three outflow arteries in a porcine model of aortic aneurysms.